I took my family to visit the Rhode Island Computer Museum this weekend. What a blast from the past! I saw some really awesome DEC PDP machines. I played with an IBM PC running PC DOS 2.1 from 1983. They have a very cool TI-99 that kids were playing games on. They had some working Apple IIe and Apple SE machines. Even an old IBM PS/1 which brought back memories. 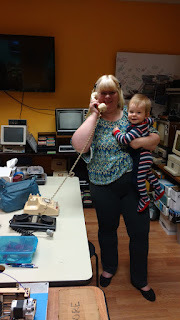 They have punch cards, handset modems (my wife can be seen holding the phone from one in the photo), magnetic core memory, teletypes, a huge selection of calculators (including a Wang calculator) and more! After about 30 minutes of nostalgia, I saw some of the cool new tech they were working with too. Dan told me all about the workshops they hold for kids who are interested in Technology. He showed me the work they are doing with Raspberry Pi and Arduino boards, the robots they have built, the music they are programming with code, the repurposed broken toys they are giving new life to, and the green screen videos they are creating. My wife was especially impressed with the 3D Computer and the Raspberry Pi. Dan also mentioned that they offer professional development for teachers. If you haven't already checked out the museum, I highly recommend it. They have a small space in the Meadows Office Park in North Kingstown and they are open on Saturdays. They also have a large warehouse with more equipment near Quonsett. Check out their website or their Facebook page for more info.